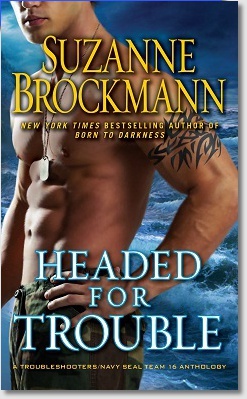 If you haven't read Suzanne Brockmann's Troubleshooters series, you're missing out on THE most exciting romantic suspense stories out there involving Navy SEALS and security operatives. Troubleshooters, Inc. is the name of the security firm launched by the former commander of SEAL Team Sixteen. Many of their assignments are a collaboration with Navy SEALs and the FBI and there are 16 amazing full length books in the series. The last full length book in the series was released in 2011 and fans are dying for at least one more to end it properly. This book seriously whets the appetite with some short stories that were previously released with promotional books or earlier released novels. This is a compilation of those stories with two new ones added. I've never read any of the stories that were included in promotional books so they were all new for me. When Frank Met Rosie just about brought me to tears; Trapped is classic Troubleshooters with its combination of angst, romance and scary ops; Home is Where the Heart is was a bit of a departure but a chance to be with Jules and Robin as secondary characters; and A Seal and Three Babies had me literally howling in laughter for most of it but then holding my breath at the end. I really miss this series and these characters and these stories brought it alive for me again. I'd forgotten how Brockmann really is in a class by herself in crafting the characters, the dialogue, the chilling missions and the smoking romances. The new stories were meaty, fresh and appealing and those I'd missed from the past were insightful and interesting. These characters are so REAL I forget they're fictional (I'm cringing as I write that). You just lose all sense of yourself and get wrapped up in the story. They may be short but Brockmann didn't cut corners. I wanted more, not more of the short stories but more books like these where I get so engrossed I become part of it. It also reminded me that the series is in limbo, with some characters stories still left undone. I thought there would be more that might have moved those situations along. I enjoyed the stories a LOT. If it was intentional to leave me hungering for more, mission accomplished in a BIG way. I know a new series similar to this one is coming out next year and I'll be one of the first to read it. It would be nice to know, though, that somehow this series will reach closure either through the new one (crossover works) or we get one more Troubleshooters full length book that wraps one of the most incredible series I've ever read. I don't think so, except maybe the last one.